Winning Moves Games has produced a brand new version of the classic family word game of Scrabble – Super Scrabble: The Deluxe Edition. 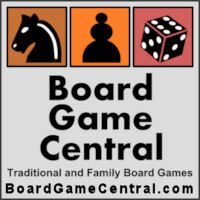 This new edition is a follow-up to Super Scrabble, which was designed by Murray Eskenazi and released by Winning Moves in 2004, and which marked the first time that the game of Scrabble had ever been altered. Super Scrabble is an officially-licensed Scrabble product and it has been approved by the National Scrabble Association (NSA). The game features 200 tiles instead of the standard 100 and comes packed with the original 100 plus a 2nd bag of 100 tiles with a slightly different letter distribution than the original 100. The board has 3 additional rows/columns of spaces and the point scoring goes as high as quadruple letters and words. Super Scrabble: The Deluxe Edition builds upon that game by improving the game board with a raised grid to hold the tiles in place, as well as a slick turntable design that places the game board on a rotating base with ball bearings on the bottom of the game board so it can be easily twisted and turned, and each player can get an optimal look at the board, without fear of scrambling the tiles on the board. 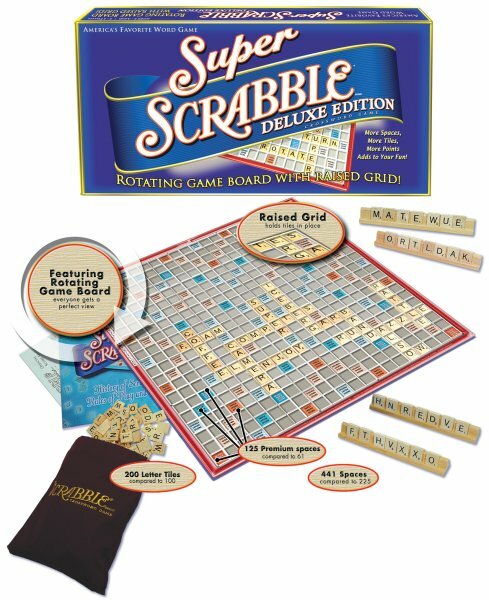 Super Scrabble: The Deluxe Edition is the ultimate Scrabble game experience! Note: This is an archive post; it was originally published on May 21, 2007.